Goa Gajah or Elephant Cave is a tourist site that is located in the village of Bedulu, Blahbatuh district, Gianyar regency, about 27 km from Denpasar. Goa Gajah or Elephant cave name is derived from the word, a word that appears in palm Negarakertagama compiled by MPU prapanca in 1365 AD. Goa Gajah built in the eleventh century AD, when it is being conducted by King of Sri Astasura Ratna Bumi . This cave functioned as a hermitage, it is proved by the presence of niches in this Goa Gajah or Elephant Cave . In addition there is also a nearby cave pool with seven statues of Widyadara-Widyadari ( angels ) who was holding the holy water. Total there are seven statues, but when I lived there only six in number, according to the clerk of the statue was moved to another location, the earthquake a few years ago. The six statue is a symbol of the seven sacred rivers in India, the birthplace of Hinduism and Buddhism. 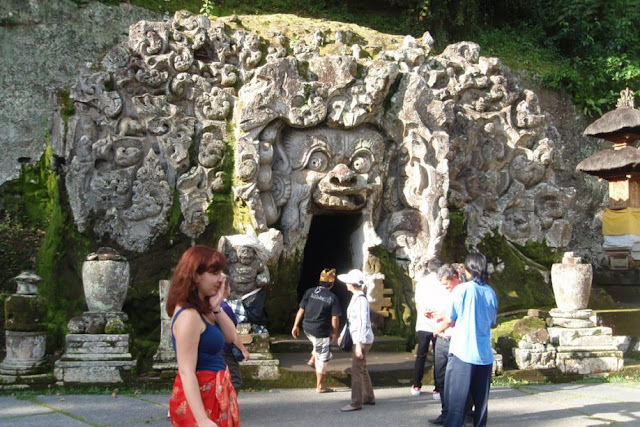 Goa Gajah temple has many ancient relics. Because the temple is visited by many foreign and domestic visitor. Goa Gajah or Elephant Cave can be divided into 3 parts. Here also there is a Hindu's most sacred buildings are very old around the Tenth century AD. What are there inside the Elephant cave ? There is a Hindu shrine shrine shrine-built after the century. While the third existing building Buddhist relics predicted by existing experts around the 8th century AD contemporary of Borobudur temple in Central Java. Recess cave in the eastern part there are three big phallus lined up on a pedestal, while in the western part of the cave there is a statue of Ganesha in the form of T. Happens in the upstream cave there are three symbols of Shiva Linga or Sang Hyang Tri Purusa. While in the down level is a statue of Ganesha is the son of Shiva in the Hindu pantheon system. Because of the Ganesh statue is by Miguel Covarrubias's cave called Goa Gajah. Functions god Ganesha in Hindu worship system is as Wighna-ghna Gods and the Gods Winayaka. Wighna means obstacle or challenge. Worship God as Lord Ganesh is worship to get spiritual guidance in order to become self-reliant in the face of obstacles or challenges of life. Ganesha is worshiped as the god Winayaka is to get God's guidance in developing life wise. Ability to face challenges and develop this wisdom as a first step to achieving a peaceful and prosperous life on this earth. In front of the cave there is a statue of Iron in a sacred bathing pool since the time buried in the ground. Currently serving head office Kriygsman Antiquities in Bali, the baths were excavated in the year of 1954. 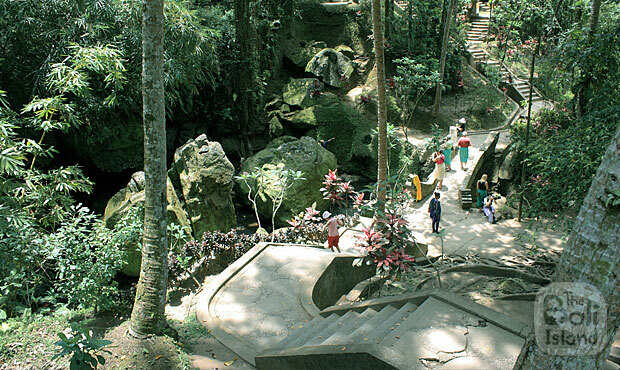 In Goa Gajah or Elephan Cave there is a statue bathing called Widyadara and Widyadhari ( angles ). These statues were six showers. The three lined up in the north and three in the south. This angel statue is placed on top of a lotus or lotus pedestal. Padma is a symbol of the universe place of Hyang Widhi ( GOD ). In the middle, there are statues of male symbol Widyadhara. The six statues Widyadhari drain the water from the center there are statues and statues of milk. Water flowing in the pool as a symbol of fertility. Purpose Linga worship God with symbols as a medium for motivating the emergence of fertility. Phallus was divided into two parts: the base and the Predana called Yoni symbol that stands above the yoni called Linga. The bottom of the rectangular-shaped phallus symbol of Brahma Bhaga, upon the octagonal symbol of Vishnu Bhaga. In the octagon elliptical. Here's a peak as Shiva Bhaga. In this Linga worship ceremony splashed with water or with milk. Water or milk is accommodated through the channel yoni. The water that is sprinkled into rice fields and plantations pleading agricultural fertility. Shower statue was a symbol of fertility water flows to build agriculture in the broad sense. In Canakya Nitisastra, water was declared one of the three Ratna Bumi Permata. Herbs food and medicine as well as words of wisdom as the two other gems Ratna. Hindu shrine at temple of Goa Gajah in addition to the existing heritage building in the Hindu Shiva Pasupata the next time there is a cult of Hindu temple in the days of Hindu Shiva Siddhanta has grown. Because it's in the south east a bit to Goa Gajah, there are several shrines. There are statues called Pelinggih supply Limas and Limas Mujung as Pelinggih Pesimpangan or transit temple of Batara Gunung Agung or Agung mountain and Mount Batur's God. There is Pelinggih ( temple ) called Gedong as ancestral shrines of Gusti Bedaulu ( king of Bedaulu ). There is also pelinggih ( temple ) called Queen Park as Vishnu worship as god of water. As the temple in general, there are also several auxiliary buildings. Such as the shrine Pengaruman, place of offerings when the ceremonial, both this temple ceremonies and other Hindu holy days. More ancient relic of Hindu heritage in Goa Gajah temple is a relic of Buddhism. Outside the cave on the western side there are statues of the Buddhist Goddess statue Hariti in Bali called Men Brayut. This statue is depicted as a woman who took a lot of children. In Buddhist mythology, Hariti this was originally a woman's flesh-eating human flesh, especially the children. After this Hariti studying the teachings of the Budha, Hariti eventually became a deeply religious and compassionate children. In south Elephant Cave through trenches found in attitudes Dhyani Buddha statues Buddha Amitabha. Buddha Dhyani Buddha Amitabha in attitude is the Mahayana Buddhist pantheon system as a Buddhist protector westbound universe. Thus three kind of form of Hindu and Buddhist religious buildings in the Pura Goa Gajah or Elephant cave temple. Hopefully this 12th things to do in Bali able to give you more idea when visiting Bali.